This week’s blog is about a photo I took in Doncaster at Cusworth Hall. I’ve always wanted to do a star trails photo since I have owned a camera but I have never fancied standing out in the cold on my own to do it. Another reason I have not been out to do some photography like this is there is a lot of light pollution in Doncaster, you do need it to be pretty dark to be able to see the stars properly in the photo. There are a couple of places on the outskirts of Doncaster where you can do a photo like this but I didn’t fancy being in a field on my own in pitch black. 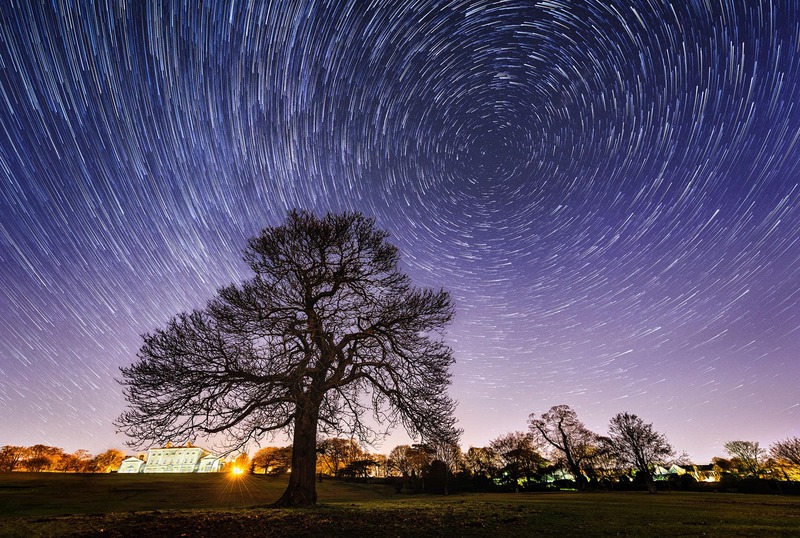 Finding a location to take pictures of star trails in South Yorkshire isn’t an easy task, I knew there was a new moon coming up so I decided I would take a drive up to Cusworth hall when it got dark enough and see what I could find. Cusworth Hall is a really nice place to go to in Doncaster and the main hall is also used as a wedding venue. People getting married at Cusworth Hall in Doncaster enjoy beautiful views over the town and great gardens for photos too. Within five minutes of being there, I managed to find what looked like an interesting tree to use as my foreground in the photo. It’s really hard to tell if your composition is right as it’s pitch black, so I had to take a couple of test shots first to make sure everything looked right in camera before I put an interval timer on and left my camera taking photos. After I had everything set up I put my camera on a timer and left it taking photos for an hour or so. It was freezing and the hour seemed to take forever to go by. Once I thought I had enough photos for this shot I headed home. I didn’t get round to editing this photo for a couple of weeks after as I had other jobs I needed to finish first.